"You guys are good. How would you like to work full time for the Justice Department?" The series took a more adult turn in the third season, as producers tried to reach a more mature audience. 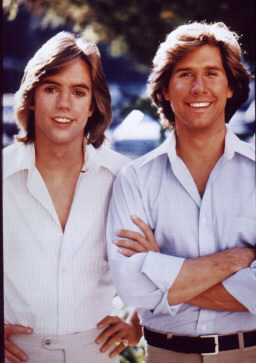 In the first episode, Joe's fiancee is killed in an accident, and the brothers join the Justice Department. The changes didn't draw a larger audience. In fact, they alienated and confused many of the teenagers who were the show's primary supporters. At fifteen years old, I didn't like the changes, but some of Parker's best episodes came out of situations that the earlier Frank Hardy would never have found himself in. Also in contrast to the previous seasons, Frank and Joe don't spend as much time on screen together. The pattern is established in the two-part "Last Kiss," when Joe pursues his own agenda and Frank does what he can to help through other channels. In "Scorpion's Sting," "Life on the Line" and "Gameplan," each brother is assigned to focus on a different aspect of a case. In "Dangerous Waters," they are separated when Joe is captured by pirates. When asked about the change of format in season three, Arlene Sidaris, one of the show's creator-producers, had this to say in Issue 12 of The Bayport Gazette: "We were looking for more exciting ways to have the characters go to more exotic locales, to go under cover, all in all to plug into the fantasties of the audience." Voted "Favorite Episode" by most of the members of The Frank and Joe Hardy Club, LKOS has a lot of Shaun, a lot of soft-focus flashbacks of Joe and his lady-love, but far less Parker than I would like! When Joe's fiancee is killed by a drunk driver, he refuses to get out of the way of the Federal agents who are trying to convict the same man of six year-old robbery/murder. Grieving and angry, Joe wants to solve the case on his own, but Frank refuses to be pushed aside. Instead, he figures out what his brother is planning and - against Joe's wishes - starts playing a supporting role as an agent on Joe's tail. My favorite Parker scene in this episode takes place early on, when Frank quietly enters the hospital waiting room where Joe has been sitting alone, in shock, after the fatal accident. The camera slowly tightens in on his face, and his expression of sadness, love and empathy. Very quiet, very simple, but utterly believable. The second best scene is when Frank, having narrowly escaped being fed to sharks by Joe's target, punches his brother in the jaw, laying him out in the sand. The episode ends with Frank and Joe accepting Harry Hammond's offer to join the Justice Department as special agents. When the Scorpion, a notorious professional kidnapper, threatens a Senator and his daughter, Frank and Joe are assigned to the case. Frank is given the unwelcome task of breaking into the apartment of the Scorpion's daughter Sheila, intimidating her, revealing her father's secret, and then bullying her into going with him to Puerto Rico so he can prove his allegations. Parker has to walk a thin line being convincing as a criminal (he tells Sheila he's a member of her father's kidnapping organization) and conveying Frank's intense dislike of what he has to do. Frank and Joe don't have much screen time together, but they do have a good scene in which Joe, concerned for the Senator's daughter, wants Frank to lean harder on the Scorpion's daughter. Frank, protective of his charge and upset by the grief he's already put her through, tries to stall, which upsets Joe. Later in his career Parker proved he makes an excellent villain. Scorpion's Sting, especially the early scenes, is a great preview of his career to come. Frank intimidating Sheila to convince her he's a member of her father's gang. Frank is unhappy with his role in this case and his brother's accusations. David Gates and Bread guest-star in this episode about the daughter of a Russian general who uses a speaker shipping case as an escape vehicle in her defection. 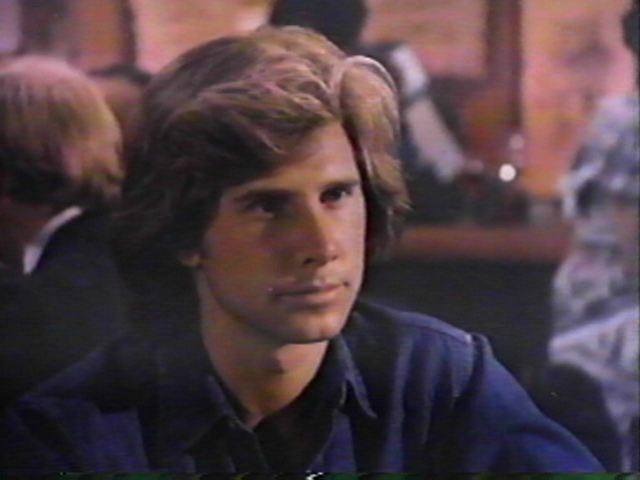 This intricately-plotted episode, written by executive producer Glen Larson, maintains a high degree of suspense, and is an excellent example of the "Hardy Boys" series, but it's not a standout episode for Parker. Joe takes the lead in solving the case, and he gets all of the best lines. Parker does a nice job, but Frank could have been removed from the script without changing the way the plot unfolded. Frank plays a cat-and-mouse game with a beautiful embezzler name Ann. He infiltrates her operation and romances her - not realizing that she knows he's a Justice agent and is playing the same game. After a while, even Joe isn't sure whose side Frank is on anymore - especially after Frank pulls a gun on him. (Check out the sound clip below.) The script is well-written and Parker gives a great performance. It's very hard to tell how much of Frank's feelings for his quarry are feigned and how much are real - or even if he seriously considered running away with her, as they discuss. Frank "auditions" for a job in Ann's gang. Frank reveals his true identity to Ann. Joe goes to Ann's hotel suite pretending to be a maintenance man. He passes his cap to Frank. There's a note in it, warning Frank about a raid and telling him to get out. Ann, suspicious, starts to pull a gun. Frank takes it from her. Joe turns to find his brother holding a gun on him. This is a long clip (30 secs) but worth taking the time to download. 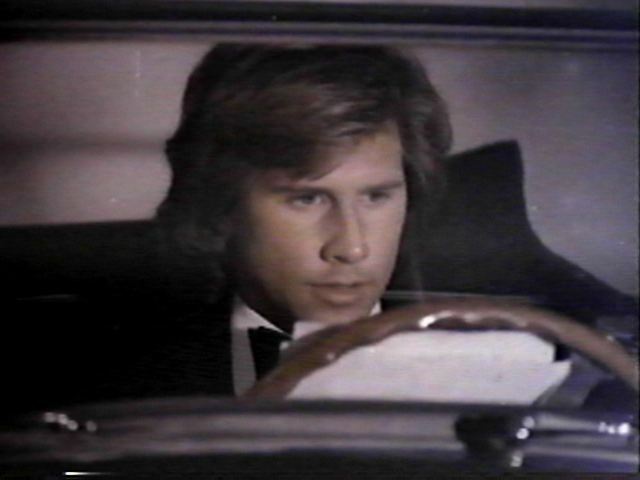 The final Hardy Boys episode was one of the weakest in the series - although it did give Parker the unusual experience of being the primary interest of both female guest stars. Frank and Joe have been assigned to protect Debbie, the daughter of a man who is about to testify against the mob. The Justice Department believes the mob will try to kidnap her to force her father to back down - but she refuses to cooperate with them. Debbie is a motocross champion, so Frank participates in the races while Joe poses as a reporter. Complications come from the extreme jealousy of Suzanne, who envies Debbie's success and high profile. 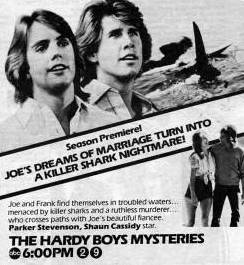 The most unusual aspect of this episode is that Frank and Joe don't solve a mystery. Their only action is to rescue Debbie from several "accidents" and Suzanne's attempt to shoot her. They don't find clues. They don't locate the bad guy (who is in a trailer at the racetrack the entire time.) Hammond is in full control of the situation, and Joe backs down after lodging an angry protest at his tactics. In the last scene, Frank rides Suzanne's bike over the empty course, her accusation, "I thought you liked me for me," echoing in voice-over. The last shot of the series is of Parker's face, half-blurred as he passes the camera. From "Last Kiss of Summer." Frank studies the floorplan of the Tower of London in "Assault on the Tower." Frank and Joe discuss developments in "Search for Atlantis." An unhappy Frank in "Search for Atlantis." Frank and Joe find a pair of stolen speakers much sooner than they would have liked in "Defection to Paradise"
Frank enjoys himself at a disco prior to beginning a life of crime in "Gameplan." by Suzanne in "Life on the Line."